Contact Form for your instructions. BUY MORE THAN ONE BOOK AND SAVE! Streets is gritty and character-driven. The narrative addresses homelessness—a chronic, contemporary issue—with a unique twist. There is robust camaraderie amongst the cast of colorful cohorts in the panhandling, street-business game. They are all just looking for a second chance some kind of avenue off the avenue. But it is Morris' inspiring and motivating experiences, coupled with the unfulfilled yearning for his ideal girl, which begin to affect his behavior and drive him to uncharacteristic acts of heroism. 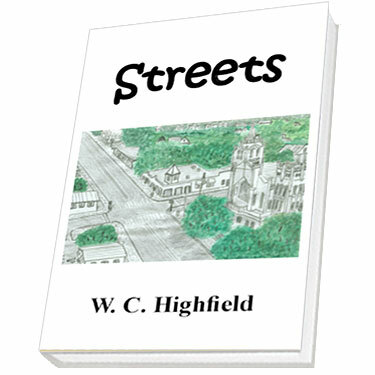 Streets is the second novel of W.C. Highfield. Concerned with the persistent quandary of homelessness in America, the author takes a quirky look at how one character gradually alters his behavior in an effort to escape its clutches. The author's debut novel is also set in Florida and is entitled IN SUN DOWN FAR.